Though it will no longer be an iconic skyscraper on the scale of Terminal Tower that our great-grandchildren will rhapsodize about when they discuss, as they often will, the local skyline, a revamped, redesigned nuCLEus complex will still be "transformational," developers say. 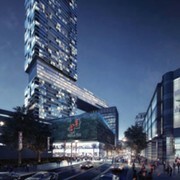 Construction on the mixed-used project in downtown Cleveland could begin as early as this August. Renderings for the new nuCLEus, hewing closely to earlier renderings we saw in January, were submitted to the city yesterday afternoon. 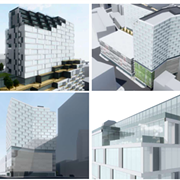 They feature two adjacent 24-story buildings, one of which would be built above a six-story parking garage. Both structures would be built on what are now primarily surface parking lots between the Quicken Loans Arena and Prospect Avenue. The new design includes significant changes from the original, 54-story sci-fi skyscraper. A hotel is no longer part of the plan, for example, and the residential units have been cut in half, from 500 to 250. (For now, these are all rental units, though condos for sale may be included.) Developer Bob Stark told the Plain Dealer that these changes were largely in response to market demands and cost concerns. Given the vast reduction in the project's size, the total price has gone down significantly as well. It's now ballparked at $300 million, as opposed to $500 million. A proposed statehouse bill that would have created a 10-percent rebate on "transformational mixed-use development" projects — originally crafted with nuCLEus in mind — is stalled for now in the General Assembly. The bill's sponsor, Rep. Kirk Schuring (R-Canton) said in December that he was confident it would pass sometime in 2019.